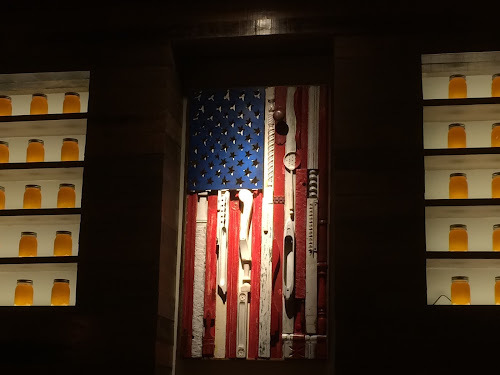 I was recently invited to a bloggers' tasting dinner at Tupelo Honey Cafe, the Arlington, Virginia outpost of the small Southern chain that originated in Asheville, North Carolina. Hence I don't consider this a typical "review," but perhaps more of a "preview," as I'd really like to go back and experience the rather delicious food under typical circumstances. Increasingly, I'm really digging Southern cooking. I'll go on and on about how much I like Southern restaurants like Macon Bistro & Larder and barbecue places like Fat Pete's. There's so much to enjoy with Southern cooking, but it's often a challenge to fit in everything you might want in a meal, given that the portions tend to be big and filling. 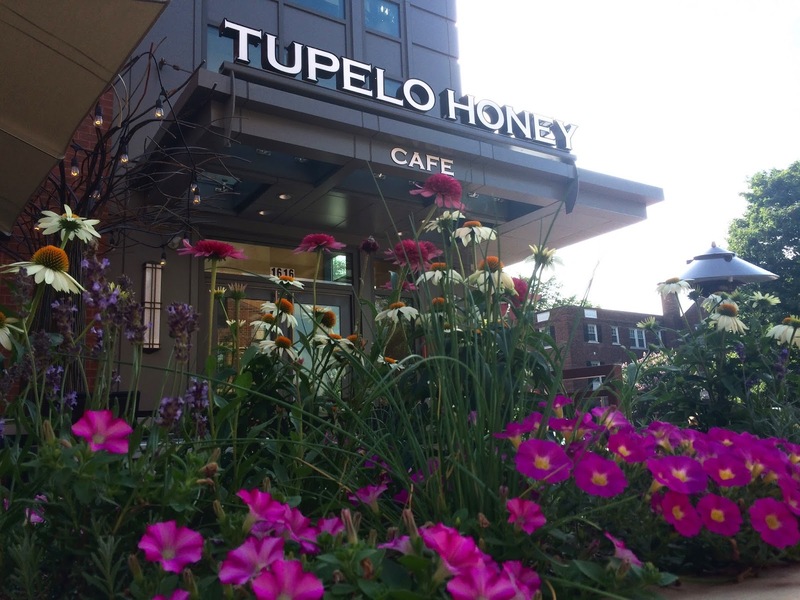 Tupelo Honey Cafe addresses that issue by offering its contemporary Southern cuisine as small plates, allowing for the creation of a unique meal that can include quite a few tastes, especially if you visit in a group. I'll get to those great small plates in a moment, but first a word on the cocktails. They're pretty fantastic. I started with a Honey & Chamomile G&T. As many of you know, classic gin & tonic is one of my favorite cocktails, and I was nervous that honey would make the drink too sweet, but it's perfect. It has that distinctive American gin flavor that isn't to everyone's liking (they use Virginia-made Commonwealth gin), but I found to be perfectly summery and refreshing in this drink. I also tried to "Ode to Eleanor Roosevelt," a white sangria exclusive to the Arlington, Virginia location made with white brandy, triple sec, sparkling wine, elderflower tonic syrup, citrus and thyme. I feel like sangria get get overplayed, but I enjoyed this drink. The thyme, in particular, gave the tart drink a nice herbal edge. Now to the food. It's petty great. Although rooted in Southern cooking, it is isn't a slave to it. Mexican, Asian and Italian influences also graced the varied list of small plates, of which there are about 15, plus salads, soups and sandwiches. There are also "supper plate" entrees, but the small plates show such creativity, that it would be a difficult decision to order one of those instead of a collection of the smaller tastes. Top: fried avocado. 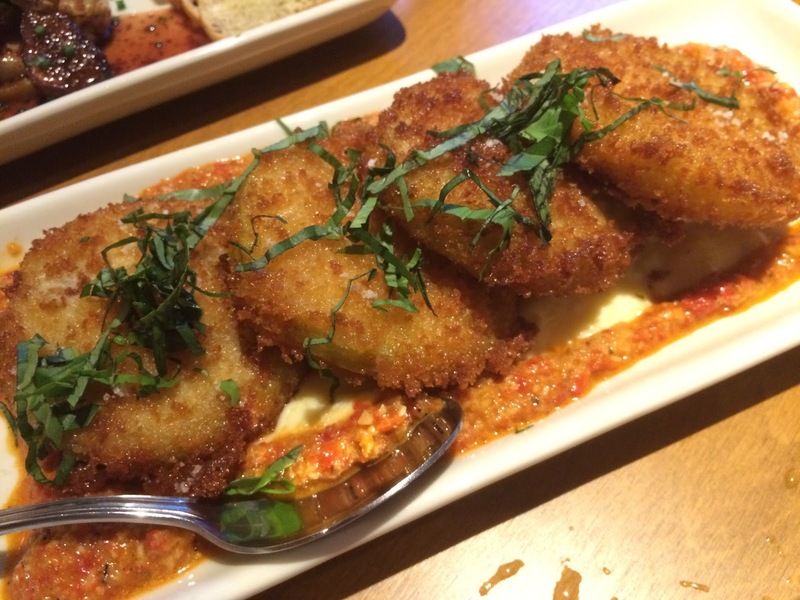 Bottom: fried green tomatoes. My favorite dish of the night was the fried avocado. I love avocado and I've never seen it fried before. 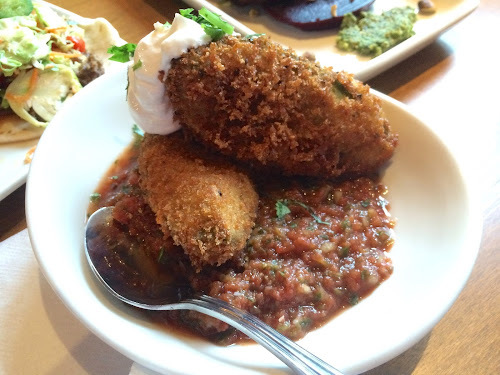 I didn't even know it was possible, but Tupelo Honey Cafe's fried version gives the green fruit a crunch exterior and a velvety warm interior. Served with fresh tomato salsa and sour cream, it's a definite must in my book. Also offering a nice crunch are the fried green tomatoes, which are served atop tangy goat cheese grits and red pepper coulis. 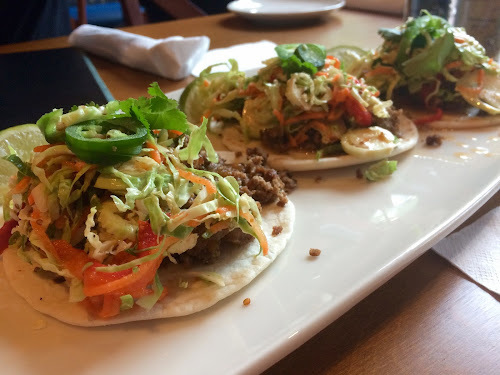 The tacos were another highlight, especially the meatloaf tacos with Brussels sprouts slaw and smoked jalapeño sauce. The meat has a wonderful barbecue flavor and I loved the jalapeño kick. Although the slaw made the taco a bit overstuffed, it was tasty accompaniment. The curried fried chicken tacos with apple salsa and cherry pepper aioli were also good but not as memorable as the other taco. Mac & cheese with shrimp. Love mac & cheese? Who doesn't, but I can be very picky about it. 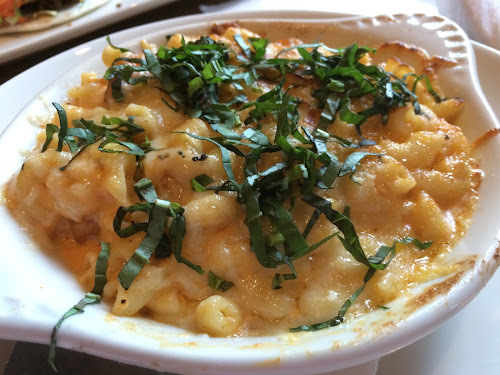 I love to make mac & cheese, and I'm often disappointed by restaurant versions, but Tupelo Honey Cafe's was one of the better attempts I've had while dining out, with good cheese flavor, fresh basil and shrimp, which was a nice touch. Less satisfying were the herbed lamb meatballs, which were fine but rather plain and therefore not as interesting as the other dishes. A nice surprise was the seared spiced yellowfin tuna, which had a little heat from cajun spice and was served with edamame, another creative sidekick. 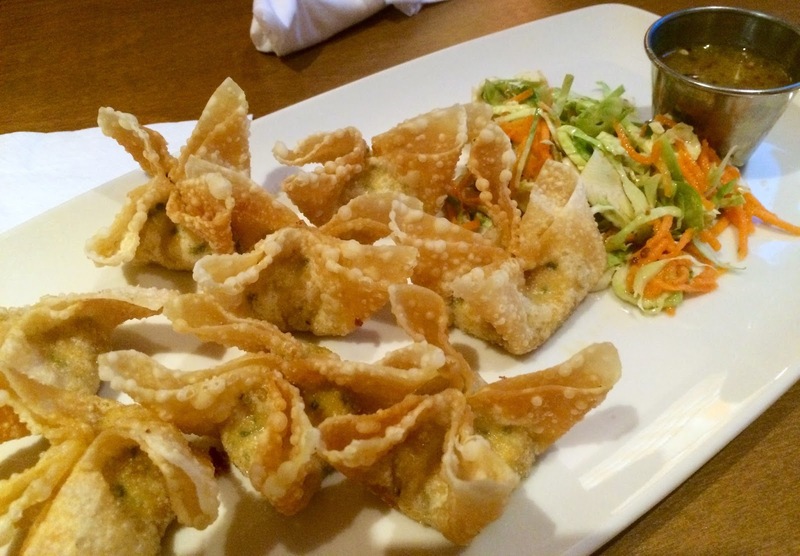 Creativity reached its peak with the NC country ham wontons. Yes, wontons! The Chinese appetizer, which Tupelo Honey Cafe makes with spot-on crispy texture, arrives stuffed with a ham-and-cheese (or perhaps cheese-and-ham, as the former dominates) filling. 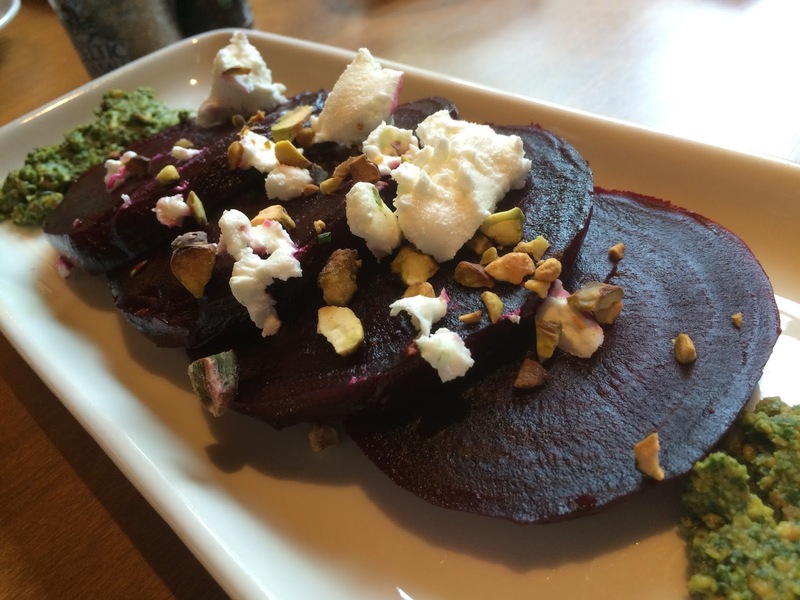 Salt roasted beets with goat cheese, pistachio and pesto. If you need to add some vegetables into this mix to feel a little virtuous, go ahead and try the salt roasted beets. They are served in that classic combination of beets with goat cheese and nuts (pistachios, in this case), but get an herbal lift from pesto. There's also an even more virtuous quinoa salad with fresh blueberries, arugula, feta and lemon. We finished our dinner with the cafe's homemade biscuits served with jam, which, although usually a side, made for a great dessert. The restaurant's dessert selection is actually rather limited to brown butter pecan pie and banana pudding. But if you want a real dessert after eating all this amazing food, you have more resolve (or perhaps just a much larger stomach) than I. Unless we're traveling, Chris and I rarely cross DC's borders for food, especially that southern border. However, I would definitely make the trip for Tupelo Honey Cafe, another wonderful entry in the bourgeoning space of creative Southern cooking. Tupelo Honey Cafe, 1616 N. Troy Street, Arlington, Virginia (near Court House Metro station). 703-253-8140.